Self-care involves empowering individuals to take control of their care, shifting the focus from treatment to well-being and prevention. It requires a change in how individuals and healthcare professionals think and work together. It provides opportunities for individuals, families and communities to build resilience and understanding of health and health literacy which, in turn, supports their decision-making abilities and receptiveness to health-promoting activities. Poor health literacy has been associated with health inequalities and poor health outcomes, so supporting parents and young people to self-care is important. There is no better time to start thinking about health literacy than during children’s early and school-age years. These are periods of rapid growth and change, when the foundations for good health can be laid. They are also periods when parents and children are most receptive to health and well-being messages. Public health nurses are ideally placed to support parents, children and young people to improve their health literacy and champion health-promoting behaviours, such as eating well and staying active. This is especially true of health visitors and school nurses, who are the leaders of the healthy child programme. The 4-5-6 model illustrates the range of evidenced-based support both groups of professionals can provide. Health visitors and school nurses can support children, young people and families to develop health literacy skills, thereby ensuring these are embedded appropriately. 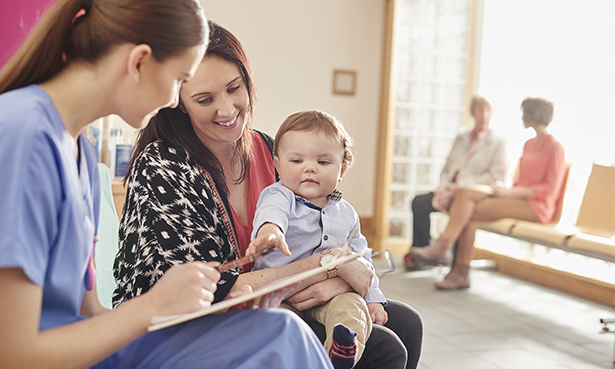 Parents value the support of health visitors throughout the maternity experience, from birth through to helping children’s readiness for school. By working with midwives, early years practitioners and other partners, therefore, health visitors can support parental health literacy and promote positive health behaviours, thereby improving parents’ and children’s well-being. Examples of such support include helping families reduce the risk of accidents around the home and improving their confidence in managing minor illnesses. As children grow and develop they strive for more independence and control over decision-making. They also become curious about their own health and well-being. This period offers opportunities for healthcare professionals to develop their health literacy which, in turn, improves children’s confidence, knowledge, and understanding. In this way professionals can work in partnership with parents, children and young people to improve health and well-being outcomes. Health visitors and school nurses are crucial to this journey and, by drawing on their specialist public health expertise to improved health literacy, they can help more families embrace self-care. Department of Health and Social Care (2009) Healthy Child Programme: Pregnancy and the First 5 Years of Life. DH, London. Public Health England (2014) Guidance. Supporting Public Health: Children, Young people and Families. PHE, London.